• Christmas is coming soon! Are you ready for inflatable Santa? What Xmas decoration can make your Xmas holiday 2013 special? Xmas Santa plays an important role during the Holiday every year, it will be also the same in 2013. Look at the Big Santa clause inflatable, it is charming, lovely and give us heppy feeling. No matter you use it for company promotion event or private party decoration, It can make your event to be special. 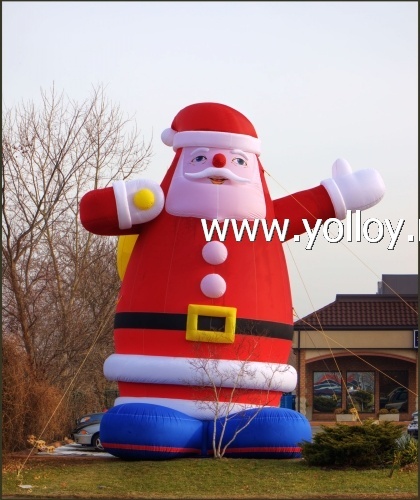 The santa inflatable is 4.5meter high, and other customer size acceptable. We use Professional PVC tarps, 12 lines high pressure nylon thread to make construct. We can give 2 years warranty for the big santa clause. For more information of the Giant santa clause or other Inflatable Christmas decorations such as blow up Christmas tree, snowmen, sleigh and so on, please feel free to contact us.